I don’t do new year’s resolutions. 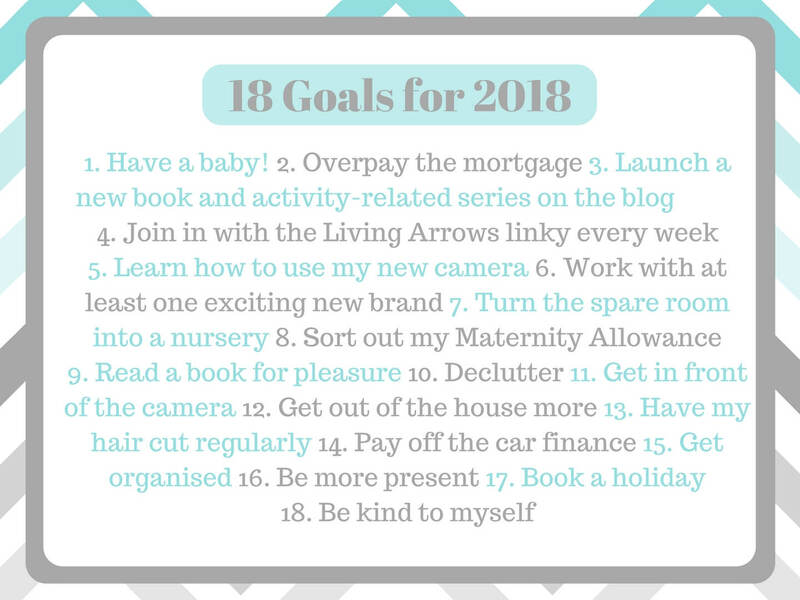 However, my lovely friend Lucy at Mrs H’s Favourite Things told me about this idea of 18 goals for 2018. I quite like the idea of having a checklist that I can just tick off, and I’m hoping that by writing about my goals here, it will give me some accountability to stick to them. Some things will be one-offs, others will be happening regardless of my intentions and some will require some dedication to stick to them! As I’m almost 27 weeks pregnant as I write this, I don’t think I really have much choice in the matter, so this one should be easy to tick off! I’ve been talking about doing this for most of 2017, but have never really felt that we’ve had enough money left over at the end of each month after household bills, expenses and our designated rainy day savings pot. However, I know it will make a massive difference to our lives in the long run, so I’m determined to make a start in 2018. Therefore, my goal will be to overpay at least £5 per month on our mortgage. Every little helps, and now I’ve said it, it will happen! I don’t want to say too much about this as you’ll see soon enough, but this is something I’m determined to do in 2018, to change up my blog content a little bit. I also want to do more activities with Little M, so by making it a blog series, I know it will happen! I really enjoyed joining in with Donna’s Living Arrows linky during 2017, and managed to link up every week, so this is something that I’m keen to continue in 2018. I saved my little socks off on Swagbucks (*affiliate link) throughout 2017, and managed to save enough to buy myself a ‘proper’ camera. Up to now, all of the photographs on my blog and Instagram have been taken on my iPhone, so I’m excited to be the proud owner of a Canon G7X mkII (**affiliate link). At the very least, I want to learn how to consistently take good photos and take at least one photograph that I’m happy with, using manual settings! One of the things I like most about blogging is that I get to discover new brands and try new things, that I wouldn’t otherwise have come across. Then, I get to share them with you! I know that 2018 will be a busy year for me with a new baby on the way in the Spring, followed by maternity leave, but I’d still like to work with at least one new brand this coming year. Little M is such a good sleeper that we’re terrified of doing anything to disrupt that (other than having a screaming newborn around, obviously! ), so we’re turning the spare room into a nursery for the new baby, rather than having the two girls share a room. The downside of this is that hubby and I need to sort out all of our books, teaching resources and other junk that’s currently inhabiting the spare room, and, frankly, get rid! We’re having a cot bed delivered on 10th January, so I’ve made this an initial deadline to get the room sorted! As I’ve been both employed and self-employed in 2017, it would appear that I have created the most complicated situation for sorting out any kind of maternity pay for myself! I had to send off my Maternity Allowance application with various notes written all over it the week before Christmas, but there are still a few more hoops to jump through before I can find out what I’m entitled to. It’s a source of anxiety that I’m keen to tick off the list! I’ve got a book on the go at the moment, but I’m half way through it, it’s still sitting on my bedroom floor, and I have no idea what the storyline even was. So, I’m setting myself the goal of reading just one adult fiction book in 2018. Okay, I’ll be honest, this one kind of links in with number seven, but it’s such an enormous job, I feel that it needs a second goal! I also need to finish decluttering our bedroom – we did a brilliant job getting rid of loads of clothes that we never wear during 2017, but we still have a dresser that’s covered in random bottles and boxes. I don’t even know what half of it is, but I know it’s been there since before M was born, and been added to since, so it needs to go! Hubby and I both have a dreadful habit of keeping empty fragrance bottles; I have no idea why we don’t just bin them! I love taking photographs, but I’m just not in enough! I need to get myself in front of the camera more, and try to teach hubby to take a decent photo (or at least learn to use my tripod and timer function)! My aim is to be in at least one photograph per month. I acknowledge that this may be a challenge with a new baby on the way, and I’ll probably cut myself some slack for a few weeks, especially if I end up having another c-section, but I’d really like to go somewhere interesting at least once each week with Little M, and with the new baby too when they arrive. Not just walking to the local swings, which M does love, but discovering new and different places to visit. I know I’m going to find this a challenge as it is infinitely easier to stay in and play! I was going to say at least once every three months, but given that’s generally the absolute minimum amount of time that I end up going between haircuts, and the hairdresser I like is by no means cheap, I think I’ll aim for not going longer than four months between cuts! It’s already been two months since the last one but I think I can justify a chop before new baby arrives. I always feel better when I’ve had a nice, clean cut. Another financial one! For about the last seven years I’ve had a new car on finance every two-and-a-half years. Nothing extravagant; two Volkswagen Polos and a Fiesta. But I love the convenience of having a new car, and I always negotiate free servicing into the deal, so other than fuel and my monthly repayments, I don’t need to worry about things going wrong! I met hubby about six months after my first brand new car, and it only took four years for him to be converted too, so now both of our cars are on finance. This wasn’t a problem at all when I was working full time, and it hasn’t really been a problem since I’ve stopped. But with baby number two on the way, we’re looking at how we can decrease our outgoings and increase our savings, so we’ve decided to pay off the balloon payment on the second car once the end of the payment term arrives in May, and keep it instead of swapping it for a new one. This means lots of saving between now and then, so that we can make it happen! I like to think that I am reasonably organised blog wise, but I have a habit of not knowing what day it is and forgetting when I’ve arranged things with people and double booking myself! So I have ordered myself a pretty diary for blog stuff and will resolve to check my phone calendar every day so that I know what I’m doing, and when! This kind of links in with number 15, as I’m hoping that being more organised will help me to achieve it. I spend far too much time faffing on my laptop or on my phone, trying to do ‘blog stuff’ but actually wasting time on social media. As a result I’m not spending as much time as I’d like with M. It doesn’t help that I don’t have any kind of office space to contain my work; my sofa is my office! So, I’m going to try to put my laptop away while she’s awake, and be as productive as I can during her nap times and once she’s gone to bed. This might have to become a little more flexible once there is a newborn in the mix, but I’m going to try to start the year as I mean to go on! I know we’re going to find it tough with a newborn, but plenty of people manage to have holidays with small children. It won’t be abroad or anything particularly fancy, but I’m determined that we’re going to have at least a little break away in 2018. Or book one for 2019! Leslie from Messy Blog UK, Hannah from Hi Baby, Kate from LesBeMums, Alex from Lamb and Bear, Ami from Through Ami’s Eyes, Lisa from Mumma Scribbles and Tinuke from Circus Mums. *Affiliate Link – By clicking this link and joining Swagbucks, you will be granting me a referral bonus on any Swagbucks that you earn. It will not cost you anything at all. **Affiliate Link – I am a participant in the Amazon Services LLC Associates Program, an affiliate advertising program designed to provide a means for sites to earn advertising fees by advertising and linking to amazon.co.uk.